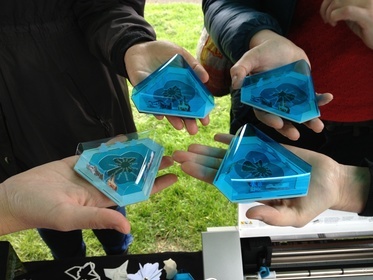 This project was an empirical design study exploring how situating digital fabrication within a souvenir-making activity can enrich an audience's encounter with cultural events and engage visitors in discussion and reflection upon their experiences. During an incremental accumulative design process, in collaboration with an arts organisation, we developed a series of fabrication activities that offered visitors the opportunity to create their own personalised souvenirs based on their experience of a cultural event. By analysing visitors' trajectories of engagement with the event we explore three key findings: activity embedded digital fabrication engages new audiences, encourages conversation and reflection, and presents organisations with new and more playful ways to gain insights into audience experiences. The On the Precipice project was the Ph.D. research of Bettina Nissen, and was conducted in collaboration with John Bowers, Peter Wright, Christopher Newell and ISIS Arts.